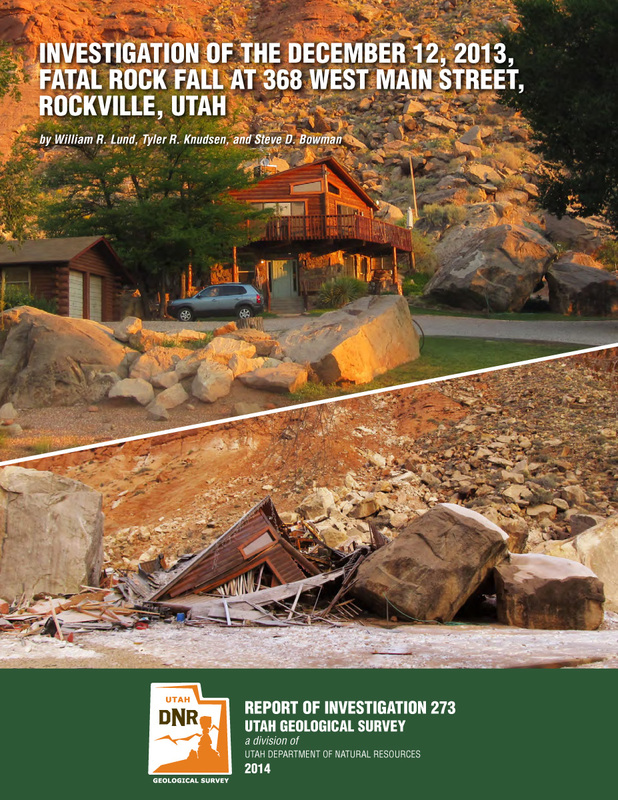 Investigation of the December 12, 2013, fatal rock fall at 368 West Main Street, Rockville, Utah: Utah Geological Survey Report of Investigation 273. This section consists of a comprehensive list of site-specific studies published by the Geologic Hazards Program beginning from 1983. These studies include published site evaluations for critical public facilities and field investigations of potential geologic hazards. In 2010, the UGS discontinued the Technical Report series, and subsequent investigations by the UGS are typically published as a Report of Investigation and listed on the Geologic Hazard Publications pages. Additional site-specific studies published by other organizations and other geologic hazard resources can be found in the UGS GeoData Archive System. Other geologic-hazard publications may exist for each region. Additional geologic-hazard publications are available at Geologic Hazard Publications, Geologic Hazard Maps, Paleoseismology of Utah, and the UGS Library. Site-specific studies are listed under individual counties. Click county on list. Geologic hazard maps and geologic hazard publications may also be available for this county. Lund, W.R., 1983, Investigation of geology and soil conditions for wastewater disposal, Kolt Mining Company mine, Beaver County, Utah, in Lund, W.R., compiler, Technical letters and memoranda for 1983 Site Investigation Section: Utah Geological and Mineral Survey Report of Investigation 190, p. 137-141. Lowe, M., 1994, A short summary of the geology, hydrology, and geologic hazards of the Whites Valley area, Box Elder County, Utah, in Mayes, B.H., compiler, Technical reports for 1994-1995 Applied Geology Program: Utah Geological Survey Report of Investigation 228, p. 3-9. Olig, S., 1991, Probablilistic ground motions along the central Wasatch Front: Implications for a seismic zone change, Salt Lake, Box Elder, Weber, Morgan, Davis, Utah, and Juab Counties, in Mayes, B.H., compiler, Technical reports for 1990-1991 Applied Geology Program: Utah Geological Survey Report of Investigation 222, p. 192-202. Ashland, F.X., 1997, Reconnaissance of a landslide along the Bear River, Honeyville, Box Elder County, Utah, in Mayes, B.H., compiler, Technical reports for 1997 Applied Geology Program: Utah Geological Survey Report of Investigation 236, p. 10-13. Solomon, B.J., 1997, Reconnaissance of landslide reactivation along the Bear River, Honeyville, Box Elder County, Utah, in Mayes, B.H., compiler, Technical reports for 1997 Applied Geology Program: Utah Geological Survey Report of Investigation 236, p. 51-52. Black, B.D., and Christenson, G.E., 1992, Geologic hazards investigation for a proposed fire station site in Lewiston, Cache County, Utah, in Mayes, B.H., and Wakefield, S.I., compilers, Technical reports for 1992-1993 Applied Geology Program: Utah Geological Survey Report of Investigation 224, p. 3-14. Case, W.F., and Christenson, G.E., 1986, Overview of communication power line routes, Logan Peak, Cache County, Utah, in Mulvey, W.E., compiler, Technical reports for 1986 Site Investigation Section: Utah Geological and Mineral Survey Report of Investigation 215, p. 145-148. Christenson, G.E., 1983, Investigation of geologic conditions at Fairway Estates Subdivision, Smithfield, Cache County, Utah, in Lund, W.R., compiler, Technical letters and memoranda for 1983 Site Investigation Section: Utah Geological and Mineral Survey Report of Investigation 190, p. 74-82. Christenson, G.E., 1983, Investigation of geologic conditions at Summit Park Subdivision, Smithfield, Cache County, Utah, in Lund, W.R., compiler, Technical letters and memoranda for 1983 Site Investigation Section: Utah Geological and Mineral Survey Report of Investigation 190, p. 85-88. Harty, K.M., 1987, Preliminary geologic hazards inventory for the Bear River Range Planning Unit, Cache and Rich Counties, Utah, in Black, B.D., compiler, Technical reports for 1987 Site Investigation Section: Utah Geological and Mineral Survey Report of Investigation 216, p. 104-113. Hylland, M.D., 1994, Geologic-hazard investigation for a parcel of state-owned land near Logan, Cache County, Utah, in Mayes, B.H., compiler, Technical reports for 1994-1995 Applied Geology Program: Utah Geological Survey Report of Investigation 228, p. 3-9. Lund, W.R., 1984, Evaluation of fill material placed on a commercial building lot in Providence, Cache County, Utah, in Harty, K.M., compiler, Technical reports for 1984 Site Investigation Section: Utah Geological and Mineral Survey Report of Investigation 198, p. 197-205. Solomon, B.J., 2003, Review of geologic-hazards reports for the proposed Bonneville Trail Estates subdivision and nearby water tank, North Logan, Utah inElliott, A.H., compiler, Technical reports for 2002-2009, Geologic Hazards Program: Utah Geological Survey Report of Investigation 269, p. 271-275. Christenson, G.E., 1983, Site investigation for a 500,000 gallon water treatment plant, East Carbon, Carbon County, Utah, in Lund, W.R., compiler, Technical letters and memoranda for 1983 Site Investigation Section: Utah Geological and Mineral Survey Report of Investigation 190, p. 13-20. Lund, W.R., 1984, Examination of Mancos Shale in Carbon County with regards to wastewater disposal, Carbon County, Utah, in Harty, K.M., compiler, Technical reports for 1984 Site Investigation Section: Utah Geological and Mineral Survey Report of Investigation 198, p. 213-214..
Lowe, M., 1992, Aerial reconnaissance of fracture in cliffs west of Castle Gate, Price Canyon, Carbon County, Utah, in Mayes, B.H., and Wakefield, S.I., compilers, Technical reports for 1992-1993 Applied Geology Program: Utah Geological Survey Report of Investigation 224, p. 59-62. Mulvey, W.E., 1989, Geologic hazards investigation of a proposed high school site, Manila, Daggett County, Utah, in Black, B.D., compiler, Technical reports for 1988-1989 Applied Geology Program: Utah Geological and Mineral Survey Report of Investigation 220, p. 35-43. Ashland, F.X., 2002, Review of slope-stability-analyses reports for the proposed Hidden Hideaway Unit No. 1 residential subdivision, Layton, Utah in Elliott, A.H., compiler, Technical reports for 2002-2009, Geologic Hazards Program: Utah Geological Survey Report of Investigation 269, p. 223-227. Ashland, F.X., and Christenson, G.E., 2003, Review of geotechnical and slope-stability-analysis reports for the proposed Chadwick Farms residential subdivision, Layton, Utah in Elliott, A.H., compiler, Technical reports for 2002-2009, Geologic Hazards Program: Utah Geological Survey Report of Investigation 269, p. 268-270. Black, B.D., and Christenson, G.E., 1991, Geologic hazards investigation of three proposed water-tank sties, Weber and Davis Counties, Utah, in Mayes, B.H., compiler, Technical reports for 1990-1991 Applied Geology Program: Utah Geological Survey Report of Investigation 222, p. 139-152. Christenson, G.E., 1984, Davis County solid waste management project facility, Davis County, Utah, in Harty, K.M., compiler, Technical reports for 1984 Site Investigation Section: Utah Geological and Mineral Survey Report of Investigation 198, p. 28-35. Christenson, G.E., 1985, Geologic hazards investigation for a proposed water tank site, Layton City, Davis County, Utah, in Mulvey, W.E., compiler, Technical reports for 1985 Site Investigation Section: Utah Geological and Mineral Survey Report of Investigation 208, p. 17-21. Gill, H.E., 1985, North Davis Refuse District Disposal site study, Davis County, Utah, in Mulvey, W.E., compiler, Technical reports for 1985 Site Investigation Section: Utah Geological and Mineral Survey Report of Investigation 208, p. 146-152. Gill, H.E., and Harty, K.M., 1984, Kaysville block 19 hazards evaluation, Davis County, Utah, in Harty, K.M., compiler, Technical reports for 1984 Site Investigation Section: Utah Geological and Mineral Survey Report of Investigation 198, p. 36-44. Giraud, R.E., 2004, Review of geotechnical/geological study, Red Fox Ridge (Wiederholt) subdivision, Layton, Utah in Elliott, A.H., compiler, Technical reports for 2002-2009, Geologic Hazards Program: Utah Geological Survey Report of Investigation 269, p. 310-312. Giraud, R.E., 2004, Review of geotechnical study and surface fault rupture study, Bromsfield subdivision, Layton, Utah in Elliott, A.H., compiler, Technical reports for 2002-2009, Geologic Hazards Program: Utah Geological Survey Report of Investigation 269, p. 321-323. Giraud, R.E., 2004, Review of geotechnical and surface-fault-rupture reports for the Springs development, Fruit Heights, Utah in Elliott, A.H., compiler, Technical reports for 2002-2009, Geologic Hazards Program: Utah Geological Survey Report of Investigation 269, p. 324-332. Giraud, R.E., 2004, Review of geotechnical and geologic-hazards-reconnaissance reports for the Hill/Athay (Silver Leaf Estates) subdivision, South Weber, Utah in Elliott, A.H., compiler, Technical reports for 2002-2009, Geologic Hazards Program: Utah Geological Survey Report of Investigation 269, p. 349-355. Giraud, R.E., 2005, Review of geotechnical and geologic-hazards evaluation for the Nalder subdivision, Layton, Utah in Elliott, A.H., compiler, Technical reports for 2002-2009, Geologic Hazards Program: Utah Geological Survey Report of Investigation 269, p. 359-363. Giraud, R.E., 2006, Review of geotechnical and geologic-hazards evaluation for 1740 East Ponderosa, Layton, Utah in Elliott, A.H., compiler, Technical reports for 2002-2009, Geologic Hazards Program: Utah Geological Survey Report of Investigation 269, p. 395-400. Giraud, R.E., 2006, Review of geotechnical and geologic-hazards evaluation for 1681 East Hillsboro Drive, Layton, Utah in Elliott, A.H., compiler, Technical reports for 2002-2009, Geologic Hazards Program: Utah Geological Survey Report of Investigation 269, p. 410-416. Harty, K.M., 1990, Preliminary geologic hazards assessment of the public works building site and the proposed city hall/police station site, City of Centerville, Davis County, Utah, in Mayes, B.H., compiler, Technical reports for 1990-1991 Applied Geology Program: Utah Geological Survey Report of Investigation 222, p. 3-8. Lowe, M., 1986, Geologic hazards investigation for a proposed water tank site, North Salt Lake City, Davis County, Utah, in Black, B.D., and Christenson, G.E., compilers, Technical reports of the Wasatch Front County geologists, June 1985 to June 1988: Utah Geological and Mineral Survey Report of Investigation 218, p. 3. Lowe, M., 1986, Preliminary geologic reconnaissance of Davis County property located in the W ½ SW ¼, Sec. 12, T. 1 N., R. 1 W., just south of the Concrete Products Company gravel pits, Weber County, Utah, in Black, B.D., and Christenson, G.E., compilers, Technical reports of the Wasatch Front County geologists, June 1985 to June 1988: Utah Geological and Mineral Survey Report of Investigation 218, p. 21-34. Lowe, M., 1986 and 1987, Geologic hazards investigation for a proposed water tank site in SE ¼ Sec. 12, T. 1 N., R. 1 W., North Salt Lake City, and Addendum to 1986 memo concerning North Salt Lake City upper water tank site, Davis County, Utah, in Black, B.D., and Christenson, G.E., compilers, Technical reports of the Wasatch Front County geologists, June 1985 to June 1988: Utah Geological and Mineral Survey Report of Investigation 218, p. 9-20. Lowe, M., 1987, Addendum to preliminary geologic reconnaissance of Davis County property located in the W ½ SW ¼, Sec. 12, %. 1 N., R. 1 W., just south of the Concrete Products Company gravel pits, Weber County, Utah, in Black, B.D., and Christenson, G.E., compilers, Technical reports of the Wasatch Front County geologists, June 1985 to June 1988: Utah Geological and Mineral Survey Report of Investigation 218, p. 30-34. Lowe, M., 1987, Geology and geologic hazards, North Davis Refuse District disposal site area, Davis County, Utah, in Black, B.D., and Christenson, G.E., compilers, Technical reports of the Wasatch Front County geologists, June 1985 to June 1988: Utah Geological and Mineral Survey Report of Investigation 218, p. 35-67. Lowe, M., 1988, Preliminary geologic hazard investigation for two proposed water storage reservoir sites, Clearfield City, Davis County, Utah, in Black, B.D., and Christenson, G.E., compilers, Technical reports of the Wasatch Front County geologists, June 1985 to June 1988: Utah Geological and Mineral Survey Report of Investigation 218, p. 68-74. Lowe, M., 1989, Geologic hazards investigation for a proposed Woods Cross City water tank site, Davis County, Utah, in Black, B.D., compiler, Technical reports for 1988-1989 Applied Geology Program: Utah Geological and Mineral Survey Report of Investigation 220, p. 25-28. Ashland, F.X., 1996, Reconnaissance geologic evaluation of the relative debris-flow hazard in the Centerville area, Davis County, Utah in Mayes, B.H., compiler, Technical reports for 1996 Applied Geology Program: Utah Geological Survey Report of Investigation 231, p. 42-44. Mulvey, W.E., 1993, Debris-flood and debris-flow hazard from Lone Pine Canyon near Centerville, Davis County, Utah: Utah Geological Survey Report of Investigation 223, 40 p.
Mulvey, W.E., and Lowe, M., 1991, Potential debris-flow volumes reaching the valley floor from the Lone Pine Canyon drainage basin, Centerville, Davis County, Utah, in Mayes, B.H., compiler, Technical reports for 1990-1991 Applied Geology Program: Utah Geological Survey Report of Investigation 222, p. 126-138. Ashland, F.X., and Elliott, A.H., 2009, Update on conditions through 2008 at the Springhill landslide, North Salt Lake, Utah in Elliott, A.H., compiler, Technical reports for 2002-2009, Geologic Hazards Program: Utah Geological Survey Report of Investigation 269, p. 187-206. Black, B.D., 1998, Reconnaissance of a landslide along the Davis-Weber canal near 1250 East South Weber Drive, South Weber, Davis County, Utah, in McDonald, G.N., compiler, Technical reports for 1998 Applied Geology Program: Utah Geological Survey Report of Investigation 242, p. 36-41. Black, B.D., and Lowe, M., 1991, Investigation of seeps and landslide potential in South Weber near 5939 S. Weber Dr., Weber and Davis Counties, Utah, in Mayes, B.H., compiler, Technical reports for 1990-1991 Applied Geology Program: Utah Geological Survey Report of Investigation 222, p. 181-185. Giraud, R.E., 1998, Reconnaissance of building distress and ground movement in the Springhill Circle area, North Salt Lake, Davis County, Utah, in McDonald, G.N., compiler, Technical reports for 1998 Applied Geology Program: Utah Geological Survey Report of Investigation 242, p. 60-75. Giraud, R.E., 1998, Reconnaissance of a landslide on East Sunset Drive, Layton, Davis County, Utah, in McDonald, G.N., compiler, Technical reports for 1998 Applied Geology Program: Utah Geological Survey Report of Investigation 242, p. 28-35. Giraud, R.E., 1998, Reconnaissance of a landslide on South Fork Kays Creek, Layton, Davis County, Utah, in McDonald, G.N., compiler, Technical reports for 1998 Applied Geology Program: Utah Geological Survey Report of Investigation 242, p. 52-59. Giraud, R.E., 2002, Movement history and preliminary hazard assessment of the Heather Drive landslide, Layton, Davis County, Utah: Utah Geological Survey Report of Investigation 251, 22 p.
Giraud, R.E., 2005, Reconnaissance of the 425 East South Weber Drive landslide, South Weber, Utah in Elliott, A.H., compiler, Technical reports for 2002-2009, Geologic Hazards Program: Utah Geological Survey Report of Investigation 269, p. 25-34. Giraud, R.E., and McDonald, G.N., 2006, Reconnaissance of the April 9, 2006, 1650 East landslide, South Weber, Utah in Elliott, A.H., compiler, Technical reports for 2002-2009, Geologic Hazards Program: Utah Geological Survey Report of Investigation 269, p. 164-177. Hylland, M.D., 1995, Reconnaissance of two landslides at the mouth of Centerville Canyon, Davis County, Utah, in Mayes, B.H., compiler, Technical reports for 1994-1995 Applied Geology Program: Utah Geological Survey Report of Investigation 228, p. 71-73. Lowe, M., 1986, Country Oaks Drive Landslide, Davis County, Utah, in Black, B.D., and Christenson, G.E., compilers, Technical reports of the Wasatch Front County geologists, June 1985 to June 1988: Utah Geological and Mineral Survey Report of Investigation 218, p. 7-8. Lowe, M., 1986, Gentile Street Landslide, Davis County, Utah, in Black, B.D., and Christenson, G.E., compilers, Technical reports of the Wasatch Front County geologists, June 1985 to June 1988: Utah Geological and Mineral Survey Report of Investigation 218, p. 6. Lowe, M., 1986, Kays Creek landslide near intersection of Fairfield Street and Church Street, Layton, Davis County, Utah, in Black, B.D., and Christenson, G.E., compilers, Technical reports of the Wasatch Front County geologists, June 1985 to June 1988: Utah Geological and Mineral Survey Report of Investigation 218, p. 21-24. Lowe M., 1986, Ward Road Landslide, Davis County, Utah, in Black, B.D., and Christenson, G.E., compilers, Technical reports of the Wasatch Front County geologists, June 1985 to June 1988: Utah Geological and Mineral Survey Report of Investigation 218, p. 2. Lund, W.R., 1984, Inspection of landslides adjacent to Hill Air Force Base, Davis County, Utah, in Harty, K.M., compiler, Technical reports for 1984 Site Investigation Section: Utah Geological and Mineral Survey Report of Investigation 198, p. 238-239. Case, W.F, 1986, Investigation of right-of-way, Red Creek tributary, Duchesne County, Utah, in Mulvey, W.E., compiler, Technical reports for 1986 Site Investigation Section: Utah Geological and Mineral Survey Report of Investigation 215, p. 137-140. Lund, W.R., 1985, Geologic evaluation of three subdivisions in Duchesne County for installation of septic tank and soil absorption field wastewater disposal systems, Duchesne County, Utah, in Mulvey, W.E., compiler, Technical reports for 1985 Site Investigation Section: Utah Geological and Mineral Survey Report of Investigation 208, p. 205-214. Giraud, R.E., 2005, Investigation of the 2005 Uinta Canyon snowmelt debris flows, Duchesne County, Utah in Elliott, A.H., compiler, Technical reports for 2002-2009, Geologic Hazards Program: Utah Geological Survey Report of Investigation 269, p. 118-133. Ashland, F.X., 1997, Reconnaissance of a landslide along Bluebell Road, Duchesne County, Utah, in Mayes, B.H., compiler, Technical reports for 1997 Applied Geology Program: Utah Geological Survey Report of Investigation 236, p. 53-58. Gill, H.E., 1984, Water tank site inspection, Elmo, Emery County, Utah, in Harty, K.M., compiler, Technical reports for 1984 Site Investigation Section: Utah Geological and Mineral Survey Report of Investigation 198, p. 17-21. Klauk, R.H., 1987, Clawson water tank site evaluation, Emery County, Utah, in Black, B.D., compiler, Technical reports for 1987 Site Investigation Section: Utah Geological and Mineral Survey Report of Investigation 216, p. 36-41. Mulvey, W.E., 1988, Town of Emery, Emery County municipal water treatment plant, in Black, B.D., compiler, Technical reports for 1988-1989 Applied Geology Program: Utah Geological and Mineral Survey Report of Investigation 220, p. 2-13. Klauk, R.H., 1985, Sewage lagoon site for Escalante, Garfield County, Utah, in Mulvey, W.E., compiler, Technical reports for 1985 Site Investigation Section: Utah Geological and Mineral Survey Report of Investigation 208, p. 191-196. Mulvey, W.E., and Lund, W.R., 1986, Geologic hazards review for the Division of State Lands and Forestry proposed land acquisition, Garfield County, Utah, Section 20 T. 37 S. R. 11 E, in Mulvey, W.E., compiler, Technical reports for 1986 Site Investigation Section: Utah Geological and Mineral Survey Report of Investigation 215, p. 132-136. Lund, W.R., 1984, Examination of a water tank site in Moab, Utah, Grand County, Utah, in Harty, K.M., compiler, Technical reports for 1984 Site Investigation Section: Utah Geological and Mineral Survey Report of Investigation 198, p. 15-16. Mulvey, W.E., 1992, Geologic-hazards investigation of a parcel of school trust land in section 2, T. 26 S., R. 19 E., Grand County, Utah, in Mayes, B.H., and Wakefield, S.I., compilers, Technical reports for 1992-1993 Applied Geology Program: Utah Geological Survey Report of Investigation 224, p. 33-39. Case, W.F., 1987, Evaluation of a proposed low-level radioactive repository, near Green River, Grand County, Utah, in Black, B.D., compiler, Technical reports for 1987 Site Investigation Section: Utah Geological and Mineral Survey Report of Investigation 216, p. 57-63. Black, B.D., 1995, Geologic-hazards investigation for a parcel of proposed school trust land near Cedar City, Iron County, Utah, in Mayes, B.H., compiler, Technical reports for 1994-1995 Applied Geology Program: Utah Geological Survey Report of Investigation 228, p. 57-66. Christenson, G.E., 1983, Investigation of the Frank Nicholes-BLM property west of Cedar City, Iron County, Utah, in Lund, W.R., compiler, Technical letters and memoranda for 1983 Site Investigation Section: Utah Geological and Mineral Survey Report of Investigation 190, p. 92-94. Lund, W.R., 1984, Geologic evaluation of three parcels of land being considered for acquisition by State Lands and Forestry on Cedar Mountain, Iron County, Utah, in Harty, K.M., compiler, Technical reports for 1984 Site Investigation Section: Utah Geological and Mineral Survey Report of Investigation 198, p. 113-118. Lund, W.R., 1985, Evaluation of recharge for Spring I, phase I, 3200 Subdivision, and geologic evaluation of phase II, 3200 Subdivision, Iron County, Utah, in Mulvey, W.E., compiler, Technical reports for 1985 Site Investigation Section: Utah Geological and Mineral Survey Report of Investigation 208, p. 72-86. Mulvey, W.E., 1993, Geologic-hazard investigation for a parcel of state-owned land in the Cross Hollow area, near Cedar City, Iron County, Utah, in Mayes, B.H., and Wakefield, S.I., compilers, Technical reports for 1992-1993 Applied Geology Program: Utah Geological Survey Report of Investigation 224, p. 97-107. Giraud, R.E., and Lund, W.R., Investigation of June 3, 2005, landslide-generated Black Mountain debris flow, Iron County, Utah in Elliott, A.H., compiler, Technical reports for 2002-2009, Geologic Hazards Program: Utah Geological Survey Report of Investigation 269, p. 143-163. Lund, W.R., Vice, G., and Buckley, J., 2005, June 3, 2005, Black Mountain debris flow, Iron County, Utah in Elliott, A.H., compiler, Technical reports for 2002-2009, Geologic Hazards Program: Utah Geological Survey Report of Investigation 269, p. 44-52. Harty, K.M., 1989, Field reconnaissance of the effects of the July 31, 1989 storm and flood on Cedar City and the Cedar Canyon landslide, Iron County, Utah, in Black, B.D., compiler, Technical reports for 1988-1989 Applied Geology Program: Utah Geological and Mineral Survey Report of Investigation 220, p. 118-121. Christenson, G.E., 1983, Slope stability analysis of Southern Utah State College and Utah State University properties east of Cedar City, Iron County, Utah, in Lund, W.R., compiler, Technical letters and memoranda for 1983 Site Investigation Section: Utah Geological and Mineral Survey Report of Investigation 190, p. 208-213. Harty, K.M., and Christenson, G.E., 1989, Cedar Canyon landslide reconnaissance, Iron County, Utah, in Black, B.D., compiler, Technical reports for 1988-1989 Applied Geology Program: Utah Geological and Mineral Survey Report of Investigation 220, p. 99-105. Christenson, G.E., 1991, Reconnaissance investigation of active ground cracks north of Newcastle, Iron County, Utah, in Mayes, B.H., compiler, Technical reports for 1990-1991 Applied Geology Program: Utah Geological Survey Report of Investigation 222, p. 162-173. Lund, W.R., 2005, June 3, 2005, rock fall in Parowan Canyon, Iron County, Utahin Elliott, A.H., compiler, Technical reports for 2002-2009, Geologic Hazards Program: Utah Geological Survey Report of Investigation 269, p. 71-82. Harty, K.M., 1992, Geologic-hazards evaluation for the Nephi Industrial Park, Juab County, Utah, in Mayes, B.H., and Wakefield, S.I., compilers, Technical reports for 1992-1993 Applied Geology Program: Utah Geological Survey Report of Investigation 224, p. 82-92. Harty, K.M., 1992, Preliminary geologic-hazards evaluation of a proposed site for a Public Safety Complex near Nephi, Juab County, Utah, in Mayes, B.H., and Wakefield, S.I., compilers, Technical reports for 1992-1993 Applied Geology Program: Utah Geological Survey Report of Investigation 224, p. 15-23. Christenson, G.E., 1984, Alton firehouse, Kane County, Utah, in Harty, K.M., compiler, Technical reports for 1984 Site Investigation Section:; Utah Geological and Mineral Survey Report of Investigation 198, p. 5. Gill, H.E., 1986, Kanab Creek Ranchos expansion individual wastewater disposal system, Kane County, Utah, in Mulvey, W.E., compiler, Technical reports for 1986 Site Investigation Section:; Utah Geological and Mineral Survey Report of Investigation 215, p. 92-99. Hecker, S., 1989, Geologic hazards investigation of proposed school sites in Big Water (Glen Canyon City), Kane County, Utah, in Black, B.D., compiler, Technical Reports for 1988-1989 Applied Geology Program:; Utah Geological and Mineral Survey Report of Investigation 220, p. 30-34. Lund, W.R., 1983, Site investigation for a medical clinic, Orderville, Kane County, Utah, in Lund, W.R., compiler, Technical letters and memoranda for 1983 Site Investigation Section:; Utah Geological and Mineral Survey Report of Investigation 190, p. 21-28. Lund, W.R., 1984, Evaluation of a proposed wastewater disposal system in Kanab Creek Canyon, Kane County, Utah, in Harty, K.M., compiler, Technical reports for 1984 Site Investigation Section:; Utah Geological and Mineral Survey Report of Investigation 198, p. 215-218. Lund, W.R., 2005, March 12, 2005, fatal earth-fall landslide along Kanab Creek, Kane County, Utah in Elliott, A.H., compiler, Technical reports for 2002-2009, Geologic Hazards Program: Utah Geological Survey Report of Investigation 269, p. 17-24. Lund, W.R., 1983, Investigation of geology and soil conditions for wastewater disposal, Delta Valley Estates, Millard County, Utah, in Lund, W.R., compiler, Technical letters and memoranda for 1983 Site Investigation Section: Utah Geological and Mineral Survey Report of Investigation 190, p. 175-180. Hecker, S., 1990, Geologic hazards investigation of two prospective elementary school sites, Morgan County, Utah, in Mayes, B.H., compiler, Technical reports for 1990-1991 Applied Geology Program: Utah Geological Survey Report of Investigation 222, p. 50-63. Hecker, S., and Christenson, G.E., 1990, Geologic hazards investigation for a prospective addition to a high school and possible seismic retrofit of a middle school, Morgan, Morgan County, Utah, in Mayes, B.H., compiler, Technical reports for 1990-1991 Applied Geology Program: Utah Geological Survey Report of Investigation 222, p. 64-77. Ashland, F.X., 2001, Preliminary hazard assessment of the Frontier Drive landslide, Mountain Green, Morgan County, Utah, in McDonald G.N., compiler, Technical reports for 2000-01 Geologic Hazards Program: Utah Geological Survey Report of Investigation 250, p. 3-10. Ashland, F.X., 2007, Active landslides in the Creekside Drive area, Mountain Green, Morgan County, Utah, between June 2005 and December 2006: Utah Geological Survey Report of Investigation 260, 25 p.
McDonald, G.N., 2003, Review of “Rockfall assessment, Phase I, Boulder Top subdivision, Morgan, Utah” in Elliott, A.H., compiler, Technical reports for 2002-2009, Geologic Hazards Program: Utah Geological Survey Report of Investigation 269, p. 286-288. Solomon, B.J., 1993, Investigation of faults near Sage Creek Junction solid waste disposal site, Rich County, Utah, in Mayes, B.H., and Wakefield, S.I., compilers, Technical reports for 1992-1993 Applied Geology Program: Utah Geological Survey Report of Investigation 224, p. 27-30. Case, W.F., 1986, Investigation of trench excavation 4100 South 6400 West, Salt Lake City, Salt Lake County, Utah, in Mulvey, W.E., compiler, Technical reports for 1986 Site Investigation Section: Utah Geological and Mineral Survey Report of Investigation 215, p. 126-129. Case, W.F., 1987, Geologic hazards investigation, proposed Department of Natural Resources building site, Salt Lake County, Utah, in Black, B.D., compiler, Technical reports for 1987 Site Investigation Section: Utah Geological and Mineral Survey Report of Investigation 216, p. 2-17. Christensen, G.E., 1983, Site review for four proposed schools in the Jordan School District, Salt Lake County, Utah, in Lund, W.R., compiler, Technical letters and memoranda for 1983 Site Investigation Section: Utah Geological and Mineral Survey Report of Investigation 190, p. 30-33. Gill, H.E., 1983, Site investigation for three schools in Granite School District, Salt Lake County, Utah, in Lund, W.R., compiler, Technical letters and memoranda for 1983 Site Investigation Section: Utah Geological and Mineral Survey Report of Investigation 190, p. 53-65. Gill, H.E., 1984, Granite School District site investigation, Salt Lake County, Utah, in Harty, K.M., compiler, Technical reports for 1984 Site Investigation Section: Utah Geological and Mineral Survey Report of Investigation 198, p. 63-74. Gill, H.E., 1984, Lone Peak Elementary school, Salt Lake County, Utah, in Harty, K.M., compiler, Technical reports for 1984 Site Investigation Section: Utah Geological and Mineral Survey Report of Investigation 198, p. 91-94. Gill, H.E., 1985, Granite School District site investigation, Salt Lake County, Utah, in Mulvey, W.E., compiler, Technical reports for 1985 Site Investigation Section: Utah Geological and Mineral Survey Report of Investigation 208, p. 23-30. Gill, H.E., 1986, Geologic hazards evaluation proposed Jordan Ridge Elementary School, Salt Lake County, Utah, in Mulvey, W.E., compiler, Technical reports for 1986 Site Investigation Section: Utah Geological and Mineral Survey Report of Investigation 215, p. 18. Gill, H., 1986, Soils investigation for area around 300 South 400 West, Salt Lake City, Salt Lake County, Utah, in Mulvey, W.E., compiler, Technical reports for 1986 Site Investigation Section: Utah Geological and Mineral Survey Report of Investigation 215, p. 130-131. Gill, H.E., 1986, Soil Investigation for Utah Occupational Safety and Health Division for a trench at 5500 West and 4700 South, Salt Lake City, Salt Lake County, Utah, in Mulvey, W.E., compiler, Technical reports for 1986 Site Investigation Section: Utah Geological and Mineral Survey Report of Investigation 215, p. 149-150. Gill, H.E., 1987, Granite school site, geologic hazards investigation, Salt Lake County, Utah, in Black, B.D., compiler, Technical reports for 1987 Site Investigation Section: Utah Geological and Mineral Survey Report of Investigation 216, p. 19-20. Klauk, R.H., 1984, Salt Lake City water tank study, Salt Lake County, Utah, in Harty, K.M., compiler, Technical reports for 1984 Site Investigation Section: Utah Geological and Mineral Survey Report of Investigation 198, p. 45-49. Klauk, R.H., 1985, Utah and Salt Lake Canal embankment stability investigation, Salt Lake County, Utah, in Mulvey, W.E., compiler, Technical reports for 1985 Site Investigation Section: Utah Geological and Mineral Survey Report of Investigation 208, p. 275-276. Klauk, R.H., 1986, Soil investigation – State Street and 2100 South, Salt Lake City, Salt Lake County, Utah, in Mulvey, W.E., compiler, Technical reports for 1986 Site Investigation Section: Utah Geological and Mineral Survey Report of Investigation 215, p. 151. Olig, S., 1991, Preliminary geologic-hazard evaluation of proposed Disaster Field Offices along the central Wasatch Front, Salt Lake, Utah, and Weber Counties, Utah, in Mayes, B.H., compiler, Technical reports for 1990-1991 Applied Geology Program: Utah Geological Survey Report of Investigation 222, p. 25-31. Harty, K.M., 1989, Freeze Canyon debris flood, Salt Lake County, Utah, in Black, B.D., compiler, Technical reports for 1988-1989 Applied Geology Program: Utah Geological and Mineral Survey Report of Investigation 220, p. 112-117. Kaliser, B.N., Jeppson, R.W., and Baty, R.S., 1984, Assessment of potential damage to real property from major debris flow in Standel Cove Subdivision, Salt Lake County, Utah: Utah Geological and Mineral Survey Report of Investigation 188, 27 p.
Case, W.F., 1987, Review of reports of deformation in excavation, University of Utah hospital extension site, Salt Lake County, Utah, in Black, B.D., compiler, Technical reports for 1987 Site Investigation Section: Utah Geological and Mineral Survey Report of Investigation 216, p. 94-98. Gill, H.E., 1986, Salt Lake County Fault map update, in Mulvey, W.E., compiler, Technical reports for 1986 Site Investigation Section: Utah Geological and Mineral Survey Report of Investigation 215, p. 141-144. Mulvey, W.E., 1987, Fault trenching in Research Park, Salt Lake City, Salt Lake County, Utah, in Black, B.D., compiler, Technical reports for 1987 Site Investigation Section: Utah Geological and Mineral Survey Report of Investigation 216, p. 90-93. Mulvey, W.E., 1991, Geologic investigation for fault-related causes of seepage problems at Lower Bells Canyon Reservoir, Salt Lake County, Utah, in Mayes, B.H., compiler, Technical reports for 1990-1991 Applied Geology Program: Utah Geological Survey Report of Investigation 222, p. 174-177. Nelson, C.V., 1985, Geoseismic evaluation, Granite fire station, Salt Lake County, Utah, in Black, B.D., and Christenson, G.E., compilers, Technical reports of the Wasatch Front County geologists, June 1985 to June 1988: Utah Geological and Mineral Survey Report of Investigation 218, p. 99-128. Nelson, C.V., 1986, Dresden Lane fault investigation, Salt Lake County, Utah, in Black, B.D., and Christenson, G.E., compilers, Technical reports of the Wasatch Front County geologists, June 1985 to June 1988: Utah Geological and Mineral Survey Report of Investigation 218, p. 129-131. Olig, S., 1989, Fault investigation – SW corner of 4200 South Redwood Road, Salt Lake County, Utah, in Black, B.D., compiler, Technical reports for 1988-1989 Applied Geology Program: Utah Geological and Mineral Survey Report of Investigation 220, p. 97-98. Olig, S., 1990, Earthquake hazards and Salt Lake City schools, Salt Lake County, Utah, in Mayes, B.H., compiler, Technical reports for 1990-1991 Applied Geology Program: Utah Geological Survey Report of Investigation 222, p. 37-49. Olig, S.S., and Mulvey, W.E., 1992, Investigation of geologic effects of the ML 4.3 March 16, 1992, earthquake, Salt Lake County, Utah, in Mayes, B.H., and Wakefield, S.I., compilers, Technical reports for 1992-1993 Applied Geology Program: Utah Geological Survey Report of Investigation 224, p. 40-43. Olig, S.S., 1993, Preliminary investigation of a lineament near Shriners Hospital for Crippled Children, Salt Lake City, Salt Lake County, Utah, in Mayes, B.H., and Wakefield, S.I., compilers, Technical reports for 1992-1993 Applied Geology Program: Utah Geological Survey Report of Investigation 224, p. 93-96. Osmond, J.C., Hewitt, W.P., and Van Horn, R., 1965, Engineering implications and geology, Hall of Justice excavation, Salt Lake City, Utah: Utah Geological and Mineralogical Survey Special Studies 11, 35 p., 1 plate. Ashland, F.X., and McDonald, G.N., 2008, Reconnaissance of the Grandview Peak rock slide, Salt Lake County, Utah: a possible earthquake-induced landslide? : Utah Geological Survey Open-File Report 518, 13 p.
Christenson, G.E., 1984, Basement flooding by ground water along 11400 South Street, South Jordan, Salt Lake County, Utah, in Harty, K.M., compiler, Technical reports for 1984 Site Investigation Section: Utah Geological and Mineral Survey Report of Investigation 198, p. 263-275. Gill, H.E., 1985, Investigation of basement flooding at the Volner residence, 8806 South 1200 West, West Jordan, Salt Lake County, Utah, in Mulvey, W.E., compiler, Technical reports for 1985 Site Investigation Section: Utah Geological and Mineral Survey Report of Investigation 208, p. 225-227. Lund, W.R., 1984, Helicopter reconnaissance of Settlement, Middle, and Butterfield Canyons, Oquirrh Mountains, Tooele and Salt Lake Counties, Utah, in Harty, K.M., compiler, Technical reports for 1984 Site Investigation Section: Utah Geological and Mineral Survey Report of Investigation 198, p. 240-243. Ashalnd, F.X., 2008, Reconnaissance of the Draper Heights landslide and other possible earthquake-induced, shallow, disrupted soil and rock slides in Draper, Utah: Utah Geological Survey Open-File Report 519, 11 p.
Ashland, F.X., 2008, Reconnaissance of the Little Valley landslide, Draper, Utah – evidence for possible late Holocene, earthquake-induced reactivation of a large pre-existing landslide: Utah Geological Survey Open-File Report 520, 17 p.
Gill, H.E., 1985, Investigation of a fatal slope failure of a construction site, Sandy, Salt Lake County, Utah, in Mulvey, W.E., compiler, Technical reports for 1985 Site Investigation Section: Utah Geological and Mineral Survey Report of Investigation 208, p. 266-267. Lund, W.R., 1984, Investigation of a debris/earth slide at 2300 E. Cottonwood Cove Lane, Salt Lake City, Salt Lake County, Utah, in Harty, K.M., compiler, Technical reports for 1984 Site Investigation Section: Utah Geological and Mineral Survey Report of Investigation 198, p. 279-281. Harty, K.M., 1992, Investigation of Jordan River discoloration and possible liquefaction at the 9400 South dam and reservoir, Salt Lake County, Utah, in Mayes, B.H., and Wakefield, S.I., compilers, Technical reports for 1992-1993 Applied Geology Program: Utah Geological Survey Report of Investigation 224, p. 44-49. Black, B.D., 1994, Investigation of a rock fall in Olympus Cove, Salt Lake County, Utah, in Mayes, B.H., compiler, Technical reports for 1994-1995 Applied Geology Program: Utah Geological Survey Report of Investigation 228, p. 10-12. Hylland, M.D., 1995, Investigation of a rock fall in Big Cottonwood Canyon, Salt Lake County, Utah, in Mayes, B.H., compiler, Technical reports for 1994-1995 Applied Geology Program: Utah Geological Survey Report of Investigation 228, p. 67-70. Christenson, G.E., 1984, Blanding middle school site, San Juan County, Utah, in Harty, K.M., compiler, Technical reports for 1984 Site Investigation Section: Utah Geological and Mineral Survey Report of Investigation 198, p. 75-82. Christenson, G.E., and Harty, K.M., 1985, Geologic site investigation for a proposed fire station, Monticello, San Juan County, Utah, in Mulvey, W.E., compiler, Technical reports for 1985 Site Investigation Section: Utah Geological and Mineral Survey Report of Investigation 208, p. 2-7. Case, W.F., 1987, Monticello landslide, San Juan County, Utah, in Black, B.D., compiler, Technical reports for 1987 Site Investigation Section: Utah Geological and Mineral Survey Report of Investigation 216, p. 79-82. Black, B.D., and Mulvey, M.E., 1991, Geologic hazards investigation of a proposed 500,000-gallon water tank site, Gunnison City, Sanpete County, Utah, in Mayes, B.H., compiler, Technical reports for 1990-1991 Applied Geology Program: Utah Geological Survey Report of Investigation 222, p. 110-118. Case, W.F., 1986, Manti Elementary School site evaluation, Sanpete County, Utah, in Mulvey, W.E., compiler, Technical reports for 1986 Site Investigation Section: Utah Geological and Mineral Survey Report of Investigation 215, p. 9-13. Case, W.F., 1986, Sanpete County landfill, Sanpete County, Utah, in Mulvey, W.E., compiler, Technical reports for 1986 Site Investigation Section: Utah Geological and Mineral Survey Report of Investigation 215, p. 61-70. Case, W.F., 1986, Site evaluation Gunnison Elementary School addition, Sanpete County, Utah, in Mulvey, W.E., compiler, Technical reports for 1986 Site Investigation Section: Utah Geological and Mineral Survey Report of Investigation 215, p. 14-17. Case, W.F., 1987, Sanpete County landfill site near Spring City, Sanpete County, Utah, in Black, B.D., compiler, Technical reports for 1987 Site Investigation Section: Utah Geological and Mineral Survey Report of Investigation 216, p. 45-53. Christenson, G.E., 1984, Sevier and Sanpete counties bibliography of geology, soils, hydrology, and geologic hazards referenced, in Harty, K.M., compiler, Technical reports for 1984 Site Investigation Section: Utah Geological and Mineral Survey Report of Investigation 198, p. 107-112. Harty, K.M., 1990, Geologic hazards investigation of a proposed 1.5 – 2.0 million-gallon water tank site, Ephraim Canyon, Sanpete County, Utah, in Mayes, B.H., compiler, Technical reports for 1990-1991 Applied Geology Program: Utah Geological Survey Report of Investigation 222, p. 95-105. Klauk, R.H., 1984, Spring City elementary school site, Sanpete County, Utah, in Harty, K.M., compiler, Technical reports for 1984 Site Investigation Section: Utah Geological and Mineral Survey Report of Investigation 198, p. 83-90. Solomon, B.J., 1998, Investigation of debris floods from Canal and Oak Creeks near Spring City, Sanpete County, Utah, in McDonald, G.N., compiler, Technical reports for 1998 Applied Geology Program: Utah Geological Survey Report of Investigation 242, p. 76-92. Christenson, G.E., 1984, Mount Pleasant ground water study, Sanpete County, Utah, in Harty, K.M., compiler, Technical reports for 1984 Site Investigation Section: Utah Geological and Mineral Survey Report of Investigation 198, p. 232-236. Lund, W.R., 1983, Geologic reconnaissance of high ground-water conditions in portions of Ephraim City, Sanpete County, Utah, in Lund, W.R., compiler, Technical letters and memoranda for 1983 Site Investigation Section: Utah Geological and Mineral Survey Report of Investigation 190, p. 190-195. Klauk, R.H., 1987, Sterling Spring study, water line hazard investigation, Sanpete County, Utah, in Black, B.D., compiler, Technical reports for 1987 Site Investigation Section: Utah Geological and Mineral Survey Report of Investigation 216, p. 42-43. Lund, W.R., 1983, Helicopter reconnaissance of slope failures in Cottonwood Canyon, Sanpete County, Utah, in Lund, W.R., compiler, Technical letters and memoranda for 1983 Site Investigation Section: Utah Geological and Mineral Survey Report of Investigation 190, p. 206-207. Case, W.E., 1985, Richfield, Utah, earthquake information for a proposed disaster response scenario, Sevier County, Utah, in Mulvey, W.E., compiler, Technical reports for 1985 Site Investigation Section: Utah Geological and Mineral Survey Report of Investigation 208, p. 248-260. Christenson, G.E., 1983, Investigation of a proposed sanitary landfill in Browns Canyon, Summit County, Utah, in Lund, W.R., compiler, Technical letters and memoranda for 1983 Site Investigation Section: Utah Geological and Mineral Survey Report of Investigation 190, p. 120-126. Christenson, G.E., 1983, Investigation of geology and soil conditions for wastewater disposal, Pine Meadows Ranch Plats E, F, and G, Summit county, Utah, in Lund, W.R., compiler, Technical letters and memoranda for 1983 Site Investigation Section: Utah Geological and Mineral Survey Report of Investigation 190, p. 158-164. Christenson, G.E., 1983, Investigation of septic tank and soil absorption system failures in Francis, Summit County, Utah, in Lund, W.R., compiler, Technical letters and memoranda for 1983 Site Investigation Section: Utah Geological and Mineral Survey Report of Investigation 190, p. 142-147. Christenson, G.E., 1984, Reconnaissance of subsurface disposal ponds for produced water from oil and gas wells, Chalk Creek Canyon, Summit County, Utah, in Harty, K.M., compiler, Technical reports for 1984 Site Investigation Section: Utah Geological and Mineral Survey Report of Investigation 198, p. 190-196. Christenson, G.E., 1984, Summit County landfill, Browns Canyon, in Harty, K.M., compiler, Technical reports for 1984 Site Investigation Section: Utah Geological and Mineral Survey Report of Investigation 198, p. 184-187. Christenson, G.E., 1985, Geologic hazards investigation of a school site in Kamas, Summit County, Utah, in Mulvey, W.E., compiler, Technical reports for 1985 Site Investigation Section: Utah Geological and Mineral Survey Report of Investigation 208, p. 38-41. Gill, H.E., 1983, Site evaluation of a proposed wastewater disposal pond for oil well drilling fluids, Summit County, Utah, in Lund, W.R., compiler, Technical letters and memoranda for 1983 Site Investigation Section: Utah Geological and Mineral Survey Report of Investigation 190, p. 135-136. Ashland, F.X., 1997, Reconnaissance of a landslide along Chalk Creek, Summit County, Utah, in Mayes, B.H., compiler, Technical reports for 1997 Applied Geology Program: Utah Geological Survey Report of Investigation 236, p. 23-33. Christenson, G.E., 1985, Clastic dikes, Smith and Moorehouse Dam, Summit County, Utah, in Mulvey, W.E., compiler, Technical reports for 1985 Site Investigation Section: Utah Geological and Mineral Survey Report of Investigation 208, p. 242-247. Christenson, G.E., 1985, Investigation of spring and well protective zones, Pine Meadow Ranch, Summit County, Utah, in Mulvey, W.E., Technical reports for 1985 Site Investigation Section: Utah Geological and Mineral Survey Report of Investigation 208, p. 87-95. Harty, K.M., 1989, Geologic investigation of a landslide in Hoytsville, Summit County, Utah, in Black, B.D., compiler, Technical reports for 1988-1989 Applied Geology Program: Utah Geological and Mineral Survey Report of Investigation 220, p. 106-111. Hylland, M.D., 1994, Reconnaissance of a landslide southwest of Hoytsville, Summit County, Utah, in Mayes, B.H., compiler, Technical reports for 1994-1995 Applied Geology Program: Utah Geological Survey Report of Investigation 228, p. 44-46. Klauk, R.H., and Harty, K.M., 1987, Sink hole and landslide investigation in Summit County, Utah, in Black, B.D., compiler, Technical reports for 1987 Site Investigation Section: Utah Geological and Mineral Survey Report of Investigation 216, p. 99-103. Olig, S., 1991, Investigation of a sinkhole 2.5 miles west-northwest of Henefer, Summit County, Utah, in Mayes, B.H., compiler, Technical reports for 1990-1991 Applied Geology Program: Utah Geological Survey Report of Investigation 222, p. 203-205. Black, B.D., 1990, Potential geologic hazards at the proposed Erda Valley Ranchettes subdivision, Tooele County, Utah, in Mayes, B.H., compiler, Technical reports for 1990-1991 Applied Geology Program: Utah Geological Survey Report of Investigation 222, p. 106-109. Lund, W.R., 1984, Geologic evaluation of five culinary water facilities and Settlement Canyon Dam for Tooele City, Tooele County, Utah: Utah Geological and Mineral Survey Report of Investigation 187, 32 p.
Solomon, B.J., 1990, Inspection of proposed site for gasoline storage and pumping station, Tooele County, Utah, in Mayes, B.H., compiler, Technical reports for 1990-1991 Applied Geology Program: Utah Geological Survey Report of Investigation 222, p. 9-12. Case, W.F., 1986, Proposed spring drainage trench site, Erda, Tooele County, Utah, in Mulvey, W.E., compiler, Technical reports for 1986 Site Investigation Section: Utah Geological and Mineral Survey Report of Investigation 215, p. 118-124. Klauk, R.H., 1985, Preliminary evaluation of high ground-water conditions in Erda, Tooele County, Utah, in Mulvey, W.E., compiler, Technical reports for 1985 Site Investigation Section: Utah Geological and Mineral Survey Report of Investigation 208, p. 228-236. Lund, W.R., 1984, Investigation of fatal trench cave-in AMAX Magnesium Corporation facility near Rowley, Tooele County, Utah, in Harty, K.M., compiler, Technical reports for 1984 Site Investigation Section: Utah Geological and Mineral Survey Report of Investigation 198, p. 244-248. Christenson, G.E., 1997, Investigation of erosional ravines in Dry Fork Canyon, Uintah County, Utah, in Mayes, B.H., compiler, Technical Reports for 1997 Applied Geology Program: Utah Geological Survey Report of Investigation 236, p. 14-22. Lund, W.R., 1983, Investigation of geologic conditions at Yellow Hills Subdivision, Uintah County, Utah, in Lund, W.R., compiler, Technical Letters and Memoranda for 1983 Site Investigation Section: Utah Geological and Mineral Survey Report of Investigation 190, p. 71-73. Lund, W.R., 1983, Investigation of seven alternate sites for a proposed high school and elementary school, Uintah School District, Uintah County, Utah, in Lund, W.R., compiler, Technical Letters and Memoranda for 1983 Site Investigation Section: Utah Geological and Mineral Survey Report of Investigation 190, p. 34-52. McDonald, G. N. and Christensen, G.E., 2000, Investigation of ground subsidence in a residential neighborhood in Vernal, Uintah County, Utah, in McDonald, G.N., compiler, Technical Reports for 2000-01 Geologic Hazards Program: Utah Geological Survey Report of Investigation 250, p. 3-10. Giraud, R.E., 1997, Geologic reconnaissance of an active landslide in Dry Fork Canyon near Vernal, Uintah County, Utah, in Mayes, B.H., compiler, Technical Reports for 1997 Applied Geology Program: Utah Geological Survey Report of Investigation 236, p. 59-64. Christenson, G.E., 1984, Sinkhole in Cedar View subdivision near Vernal, Uintah County, Utah, in Harty, K.M., compiler, Technical Reports for 1984 Site Investigation Section: Utah Geological and Mineral Survey Report of Investigation 198, p. 255-256. Ashland, F.X., 2002, Review of geotechnical and geologic hazards reports for the proposed Foothill Park residential subdivision, Provo, Utah in Elliott, A.H., compiler, Technical reports for 2002-2009, Geologic Hazards Program: Utah Geological Survey Report of Investigation 269, p. 241-243. Ashland, F.X., 2005, Review of “Geotechnical and geological study, Valley Vistas, Provo, Utah” in Elliott, A.H., compiler, Technical reports for 2002-2009, Geologic Hazards Program: Utah Geological Survey Report of Investigation 269, p. 356-358. Ashland, F.X., and Christenson, G.E., 2003, Review of “North Fork Special Services District, slope stability analysis” in Elliott, A.H., compiler, Technical reports for 2002-2009, Geologic Hazards Program: Utah Geological Survey Report of Investigation 269, p. 302-305. Black, B.D., 1994, Geologic hazards investigation, proposed water-tank site, Provo, Utah County, Utah, in Mayes, B.H., compiler, Technical reports for 1994-1995 Applied Geology Program: Utah Geological Survey Report of Investigation 228, p. 13-25. Christenson, G.E., 1983, Evaluation of soil and geologic conditions at the proposed Heatheridge Subdivision and Hidden Hollow Condominiums, Orem, Utah County, Utah, in Lund, W.R., compiler, Technical letters and memoranda for 1983 Site Investigation Section: Utah Geological and Mineral Survey Report of Investigation 190, p. 69-70. Christenson, G.E., 1985, Engineering geologic investigation for a 100,000 gallon water tank, Springville, Utah County, Utah, in Mulvey, W.E., Technical reports for 1985 Site Investigation Section: Utah Geological and Mineral Survey Report of Investigation 208, p. 14-16. DuRoss, C.B., and Christenson, G.E., 2004, Review of geologic-hazards report for the proposed Three Falls Ranch subdivision, Alpine, Utah in Elliott, A.H., compiler, Technical reports for 2002-2009, Geologic Hazards Program: Utah Geological Survey Report of Investigation 269, p. 338-343. DuRoss, C.B., and Christenson, G.E., 2005, Review of “Geotechnical and geological study, the Ranger Station, Provo, Utah” in Elliott, A.H., compiler, Technical reports for 2002-2009, Geologic Hazards Program: Utah Geological Survey Report of Investigation 269, p. 376-381. Gill, H.E., 1983, Investigation of two proposed sites for a 5 million gallon water tank, Provo, Utah County, Utah, in Lund, W.R., compiler, Technical letters and memoranda for 1983 Site Investigation Section: Utah Geological and Mineral Survey Report of Investigation 190, p. 5-12. Gill, H.E., 1984, Alpine School District school sites, Utah County, Utah, in Harty, K.M., compiler, Technical reports for 1984 Site Investigation Section: Utah Geological and Mineral Survey Report of Investigation 198, p. 95-98. Giraud, R.E., 2004, Review of the geologic-hazard and slope-stability study, lot D-83, Sherwood Hills subdivision, Provo, Utah in Elliott, A.H., compiler, Technical reports for 2002-2009, Geologic Hazards Program: Utah Geological Survey Report of Investigation 269, p. 313-316. Giraud, R.E., 2004, Review of geological hazards and slope stability report for the proposed Heritage Hills development, Alpine, Utah in Elliott, A.H., compiler, Technical reports for 2002-2009, Geologic Hazards Program: Utah Geological Survey Report of Investigation 269, p. 333-337. Klauk, R.H., 1985, Geologic hazards evaluation for a site in the Pole Canyon area, Spanish Fork Canyon, Utah County, Utah, in Mulvey, W.E., compiler, Technical reports for 1985 Site Investigation Section: Utah Geological and Mineral Survey Report of Investigation 208, p. 268-271. Klauk, R.H., 1986, Provo City landfill site, Utah County, Utah, in Mulvey, W.E., compiler, Technical reports for 1986 Site Investigation Section: Utah Geological and Mineral Survey Report of Investigation 215, p. 59-60. Olig, S., 1990, Geologic hazards investigation for a proposed Highland City office building site, Utah County, Utah, in Mayes, B.H., compiler, Technical reports for 1990-1991 Applied Geology Program: Utah Geological Survey Report of Investigation 222, p. 13-24. Robison. R.M., 1987, Evaluation of lineaments at the proposed Provo City landfill, Goshen Valley, Utah County, Utah, in Black, B.D., and Christenson, G.E., compilers, Technical reports of the Wasatch Front County geologists, June 1985 to June 1988: Utah Geological and Mineral Survey Report of Investigation 218, p. 144-154. Robison, R.M., 1987, Geologic hazards in the Payson City golf course area, Utah County, Utah, in Black, B.D., and Christenson, G.E., compilers, Technical reports of the Wasatch Front County geologists, June 1985 to June 1988: Utah Geological and Mineral Survey Report of Investigation 218, p. 138-139. Robison, R.M., 1987, Preliminary geologic hazard investigation for the Emergency Service storage buildings, Utah County, Utah, in Black, B.D., and Christenson, G.E., compilers, Technical reports of the Wasatch Front County geologists, June 1985 to June 1988: Utah Geological and Mineral Survey Report of Investigation 218, p. 133-137. Robison, R.M., 1988, A review of geologic hazards for a proposed water tank for Mapleton City, Utah County, Utah, in Black, B.D., and Christenson, G.E., compilers, Technical reports of the Wasatch Front County geologists, June 1985 to June 1988: Utah Geological and Mineral Survey Report of Investigation 218, p. 140-143. Willis, G.C., 1987, Investigation of potential geologic hazards near the Thistle landslide, Utah County, Utah: Utah Geological and Mineral Survey Report of Investigation 213, 24 p.
Hylland, M.D., 1994, Debris-flow and debris-flood potential in the Trojan #2 burn area near Mapleton, Utah County, Utah, in Mayes, B.H., compiler, Technical reports for 1994-1995 Applied Geology Program: Utah Geological Survey Report of Investigation 228, p. 47-51. Klauk, R.H., 1984, Springs and debris flow evaluation for the Manilla Culinary Water Company, Utah County, Utah, in Harty, K.M., compiler, Technical reports for 1984 Site Investigation Section: Utah Geological and Mineral Survey Report of Investigation 198, p. 177-182. McDonald, G.N., and Giraud, R.E., 2002, September 12, 2002, fire-related debris flows east of Santaquin and Spring Lake, Utah County, Utah in Elliott, A.H., compiler, Technical reports for 2002-2009, Geologic Hazards Program: Utah Geological Survey Report of Investigation 269, p. 2-16. Solomon, B.J., 1992, Debris-flow and debris-flood potential in the Big Hollow burn area north of Alpine, Utah County, Utah, in Mayes, B.H., and Wakefield, S.I., compilers, Technical reports for 1992-1993 Applied Geology Program: Utah Geological Survey Report of Investigation 224, p. 56-58. Solomon, B.J., 1992, Debris-flow and debris-flood potential in the Mahogany Mountain burn area north of Pleasant Grove, Utah County, Utah, in Mayes, B.H., and Wakefield, S.I., compilers, Technical reports for 1992-1993 Applied Geology Program: Utah Geological Survey Report of Investigation 224, p.63-65. Solomon, B.J., and Giraud, R.E., 1997, Reconnaissance of a debris flood in Orem, Utah County, Utah, in Mayes, B.H., compiler, Technical reports for 1997 Applied Geology Program: Utah Geological Survey Report of Investigation 236, p. 65-73. Ashland, F.X., and Christenson, G.E., 2003, Review of “Surface fault rupture hazard investigation phase I, Norma Thomas Property, Provo, Utah” in Elliott, A.H., compiler, Technical reports for 2002-2009, Geologic Hazards Program: Utah Geological Survey Report of Investigation 269, p. 258-259. Giraud, R.E., 2003, Review of “Surface fault rupture assessment and report for Aspen Summit Development 22 acre property, Provo, Utah” in Elliott, A.H., compiler, Technical reports for 2002-2009, Geologic Hazards Program: Utah Geological Survey Report of Investigation 269, p. 280-285. Klauk, R.H., 1985, Zone of deformation determination along a portion of the Wasatch fault in Provo, Utah County, Utah, in Mulvey, W.E., compiler, Technical reports for 1985 Site Investigation Section: Utah Geological and Mineral Survey Report of Investigation 208, p. 261-265. Ashland, F.X., 1996, Geologic reconnaissance of a piping-induced slope failure near 830 South Scenic Drive, Spanish Fork, Utah County, Utah, in Mayes, B.H., Technical reports for 1996 Applied Geology Program: Utah Geological Survey Report of Investigation 231, p. 45-49. Ashland, F.X., 1997, Reconnaissance of the Shurtz Lake landslide, Utah County, Utah: Utah Geological and Mineral Survey Report of Investigation 234, 22 p.
Ashland, F.X., 2005, Landslide of 2005 at a horse ranch near the East Lawn Memorial Hills Cemetery, Provo, Utah County, Utah in Elliott, A.H., compiler, Technical reports for 2002-2009, Geologic Hazards Program: Utah Geological Survey Report of Investigation 269, p. 106-117. Ashland, F.X., 2005, Preliminary assessment of two landslides in 2005 between a sewer line and Gordon Creek, Mountain Green, Morgan County, Utah in Elliott, A.H., compiler, Technical reports for 2002-2009, Geologic Hazards Program: Utah Geological Survey Report of Investigation 269, p. 134-142. Ashland, F.X., McDonald, G.N., 2005, The Sage Vista Lane landslide, Cedar Hills, Utah in Elliott, A.H., compiler, Technical reports for 2002-2009, Geologic Hazards Program: Utah Geological Survey Report of Investigation 269, p. 83-105. Black, B.D., 1994, Geologic reconnaissance of a slope failure near 440 South Scenic Drive, Spanish Fork, Utah County, Utah, in Mayes, B.H., compiler, Technical reports for 1994-1995 Applied Geology Program: Utah Geological Survey Report of Investigation 228, p. 52-56. Black, B.D., and Solomon, B.J., 1995, Geologic reconnaissance of a slope failure in Spanish Fork Canyon, Utah County, Utah, in Mayes, B.H., compiler, Technical reports for 1994-1995 Applied Geology Program: Utah Geological Survey Report of Investigation 228, p. 80-84. Giraud, R.E., and Christenson, G.E., 2005, Investigation of the May 12, 2005, 1550 East Provo rock fall, Provo, Utah in Elliott, A.H., compiler, Technical reports for 2002-2009, Geologic Hazards Program: Utah Geological Survey Report of Investigation 269, p. 35-43. Giraud, R.E., Elliott, A.H., and Castleton, J.J., 2009, Investigation of the April 11, 2009, 1550 East Provo rock fall, Provo, Utah in Elliott, A.H., compiler, Technical reports for 2002-2009, Geologic Hazards Program: Utah Geological Survey Report of Investigation 269, p. 207-219. Harty, K.M., 1991, Investigation of a rock fall in Hobble Creek Canyon, Utah County, Utah, in Mayes, B.H., compiler, Technical reports for 1990-1991 Applied Geology Program: Utah Geological Survey Report of Investigation 222, p. 178-180. Christenson, G.E., 1983, Investigation of geology and soil conditions for wastewater disposal, Strawberry Lake Estates Area C, Wasatch County, Utah, in Lund, W.R., compiler, Technical letters and memoranda for 1983 Site Investigation Section: Utah Geological and Mineral Survey Report of Investigation 190, p. 165-174. Christenson, G.E., 1983, Investigation of geology and soil conditions for wastewater disposal, Strawberry Lake Estates Subdivision, Wasatch County, Utah, in Lund, W.R., compiler, Technical letters and memoranda for 1983 Site Investigation Section: Utah Geological and Mineral Survey Report of Investigation 190, p. 181-186. Gill, H.E., 1985, Jordan Ranch Mobile Home Park septic tank suitability evaluation, Wasatch County, Utah, in Mulvey, W.E., compiler, Technical reports for 1985 Site Investigation Section: Utah Geological and Mineral Survey Report of Investigation 208, p. 183-190. Gill, H.E., 1985, Suitability of calcium carbonate deposits near Midway, Utah for installation of individual wastewater disposal systems, Wasatch County, Utah, in Mulvey, W.E., compiler, Technical reports for 1985 Site Investigation Section: Utah Geological and Mineral Survey Report of Investigation 208, p. 215-223. Gill, H.E., 1985, Timberlakes Plat 18, Wasatch County, Utah, in Mulvey, W.E., compiler, Technical reports for 1985 Site Investigation Section: Utah Geological and Mineral Survey Report of Investigation 208, p. 197-204. Gill, H.E., 1986, Wallsburg Estates Subdivision, Wasatch County, Utah, in Mulvey, W.E., compiler, Technical reports for 1986 Site Investigation Section: Utah Geological and Mineral Survey Report of Investigation 215, p. 100-107. Hylland, M.D., 1996, Summary of test-pit observations to evaluate soil and rock suitability for wastewater disposal, Wasatch View Acres, Wasatch County, Utah, in Mayes, B.H., Technical reports for 1996 Applied Geology Program: Utah Geological Survey Report of Investigation 231, p. 21-22. Klauk, R.H., 1986, Experimental wastewater disposal systems, Wasatch County, Utah, in Mulvey, W.E., compiler, Technical reports for 1986 Site Investigation Section: Utah Geological and Mineral Survey Report of Investigation 215, p. 89-91. Lund, W.R., and Black, B.D., 1987, Field reconnaissance of four proposed sanitary landfill sites in Wasatch County, Utah, in Black, B.D., compiler, Technical reports for 1987 Site Investigation Section: Utah Geological and Mineral Survey Report of Investigation 216, p. 64-77. Lund, W.R., and Gill, H.E., 1984, Investigation of 6 test pits for Wasatch County Health Department; suitability for septic tank drainfields, Wasatch County, Utah,in Harty, K.M., compiler, Technical reports for 1984 Site Investigation Section: Utah Geological and Mineral Survey Report of Investigation 198, p. 206-212. Mulvey, W.E., 1988, Preliminary geologic investigation for Wasatch County landfill site, northwestern Heber Valley, Wasatch County, Utah, in Black, B.D., compiler, Technical reports for 1988-1989 Applied Geology Program: Utah Geological and Mineral Survey Report of Investigation 220, p. 66-75. Mulvey, W.E., 1989, Preliminary geologic investigation for proposed landfill sites, Wasatch County, Utah, in Black, B.D., compiler, Technical reports for 1988-1989 Applied Geology Program: Utah Geological and Mineral Survey Report of Investigation 220, p. 76-92. Solomon, B.J., 2002, Review of “Geologic and geotechnical investigation, Pioche residential development west of Keetley, Wasatch County, Utah” inElliott, A.H., compiler, Technical reports for 2002-2009, Geologic Hazards Program: Utah Geological Survey Report of Investigation 269, p. 228-232. Solomon, B.J., 2002, Review of “Deer Canyon Preserve, Jordanelle Basin, Wasatch County – soils report” in Elliott, A.H., compiler, Technical reports for 2002-2009, Geologic Hazards Program: Utah Geological Survey Report of Investigation 269, p. 233-236. Solomon, B.J., 2002, Review of “Geotech report, Bonanza Mountain Resort, Wasatch County preliminary plan package” in Elliott, A.H., compiler, Technical reports for 2002-2009, Geologic Hazards Program: Utah Geological Survey Report of Investigation 269, p. 237-240. Solomon, B.J., 2002, Review of “Preliminary subsurface report, North Village 50-acre site” in Elliott, A.H., compiler, Technical reports for 2002-2009, Geologic Hazards Program: Utah Geological Survey Report of Investigation 269, p. 244-247. Solomon, B.J., 2002, Review of “Engineering geology assessment, 30-acre parcel, Deer Creek Drive, Timber Lakes development, Wasatch County, Utah”in Elliott, A.H., compiler, Technical reports for 2002-2009, Geologic Hazards Program: Utah Geological Survey Report of Investigation 269, p. 248-250. Solomon, B.J., 2002, Review of “Preliminary geologic/geotechnical investigation, Little Pole Canyon property, east of Heber City, Utah” in Elliott, A.H., compiler, Technical reports for 2002-2009, Geologic Hazards Program: Utah Geological Survey Report of Investigation 269, p. 251-254. Solomon, B.J., 2003, Review of “Geotechnical investigation, Crossings at Lake Creek development, east of Heber City, Utah” in Elliott, A.H., compiler, Technical reports for 2002-2009, Geologic Hazards Program: Utah Geological Survey Report of Investigation 269, p. 255-257. Solomon, B.J., 2003, Review of “Mustang Property – lower property development, geologic and preliminary geotechnical investigation, Wasatch County, Utah” in Elliott, A.H., compiler, Technical reports for 2002-2009, Geologic Hazards Program: Utah Geological Survey Report of Investigation 269, p. 264-267. Solomon, B.J., 2003, Review of “Geologic and geotechnical report – proposed North Village at Jordanelle Ridge development, Wasatch County, Utah” in Elliott, A.H., compiler, Technical reports for 2002-2009, Geologic Hazards Program: Utah Geological Survey Report of Investigation 269, p. 276-279. Solomon, B.J., 2003, Review of “Deer Meadows soils report – Jordanelle Basin, Wasatch County” in Elliott, A.H., compiler, Technical reports for 2002-2009, Geologic Hazards Program: Utah Geological Survey Report of Investigation 269, p. 289-293. Solomon, B.J., 2003, Review of “Geotechnical investigation and report – North Village 17-acre site, Wasatch County, Utah” in Elliott, A.H., compiler, Technical reports for 2002-2009, Geologic Hazards Program: Utah Geological Survey Report of Investigation 269, p. 298-301. Solomon, B.J., 2003, Review of “College Downs at the North Village – Off Site Storm Water Analysis” in Elliott, A.H., compiler, Technical reports for 2002-2009, Geologic Hazards Program: Utah Geological Survey Report of Investigation 269, p. 306-309. Solomon, B.J., 2005, Review of “Geologic and geotechnical investigation, proposed residential development southwest of Wallsburg, Wasatch County, Utah” in Elliott, A.H., compiler, Technical reports for 2002-2009, Geologic Hazards Program: Utah Geological Survey Report of Investigation 269, p. 368-372. Solomon, B.J., 2005, Review of “Geological hazards assessment – Victory Ranch (phase 1), Wasatch County, Utah” in Elliott, A.H., compiler, Technical reports for 2002-2009, Geologic Hazards Program: Utah Geological Survey Report of Investigation 269, p. 382-386. Solomon, B.J., 2006, Review of “Slope stability study, proposed Area C, Wasatch County, Utah” in Elliott, A.H., compiler, Technical reports for 2002-2009, Geologic Hazards Program: Utah Geological Survey Report of Investigation 269, p. 405-409. Solomon, B.J., 2007, Review of “Preliminary geotechnical and geological investigation, 350 acre Cummings property, Wasatch County, Utah” in Elliott, A.H., compiler, Technical reports for 2002-2009, Geologic Hazards Program: Utah Geological Survey Report of Investigation 269, p. 417-421. Gill, H.E., 1985, Investigation of a debris flow near the K&J Subdivision, Wasatch County, Utah, in Mulvey, W.E., compiler, Technical reports for 1985 Site Investigation Section: Utah Geological and Mineral Survey Report of Investigation 208, p. 272-274. Ashland, F.X., 2006, Reconnaissance of a large landslide upslope of the Mill Hollow Dam, Wasatch County, Utah in Elliott, A.H., compiler, Technical reports for 2002-2009, Geologic Hazards Program: Utah Geological Survey Report of Investigation 269, p. 178-186. Ashland, F.X., and Hylland, M.D., 1997, Preliminary geotechnical-engineering slope-stability investigation of the Pine Ridge landslide, Timber Lakes Estates, Wasatch County: Utah Geological Survey Report of Investigation 232, 29 p.
Klauk, R.H., and Mulvey, W., 1987, Study of landslides west of the K & J subdivision in Snake Creek Canyon, Wasatch County, Utah: Utah Geological and Mineral Survey Report of Investigation 214, 28 p.
Neuffer, D.P., and Bruhn, R.L., 2005, Landslide investigation of Timber Lakes Estates, Wasatch County, Utah – landslide inventory and preliminary geotechnical-engineering slope stability analysis: Utah Geological Survey Miscellaneous Publication 05-9, 65 p., 4 plates, scale 1:2,400, compact disk. Ashland, F.X., 1996, Investigation of a rock fall on State Route 189, Wasatch County, Utah, in Mayes, B.H., Technical reports for 1996 Applied Geology Program: Utah Geological Survey Report of Investigation 231, p. 50-52. Case, W.F., 1986, Geologic site investigation for a proposed fire station, Hildale, Washington County, Utah, in Mulvey, W.E., compiler, Technical reports for 1986 Site Investigation Section: Utah Geological and Mineral Survey Report of Investigation 215, p. 2-6. Case, W.F., 1987, Geologic site investigation of a water tank site, Hildale Town, Washington County, Utah, in Black, B.D., compiler, Technical reports for 1987 Site Investigation Section: Utah Geological and Mineral Survey Report of Investigation 216, p. 28-35. Christenson, G.E., 1983, Investigation of geology and soil conditions for wastewater disposal, C. Blake property and Dammeron Valley Farms Subdivision, Washington County, Utah, in Lund, W.R., compiler, Technical letters and memoranda for 1983 Site Investigation Section: Utah Geological and Mineral Survey Report of Investigation 190, p. 128-134. Christenson, G.E., 1984, Central water tank investigation, Washington County, Utah, in Harty, K.M., compiler, Technical reports for 1984 Site Investigation Section: Utah Geological and Mineral Survey Report of Investigation 198, p. 22-27. Christenson, G.E., 1984, Investigation of seven school sites in Washington County, Utah, in Harty, K.M., compiler, Technical reports for 1984 Site Investigation Section: Utah Geological and Mineral Survey Report of Investigation 198, p. 51-62. Christenson, G.E., 1985, Geologic investigation of two proposed high school sites, Cedar City, Washington County, Utah, in Mulvey, W.E., Technical reports for 1985 Site Investigation Section: Utah Geological and Mineral Survey Report of Investigation 208, p. 31-37. Gill, H.E., 1984, LaVerkin firehouse site inspection, Washington County, Utah, in Harty, K.M., compiler, Technical reports for 1984 Site Investigation Section: Utah Geological and Mineral Survey Report of Investigation 198, p. 9-11. Gill, H.E., 1984, Pintura water tank inspection, Washington County, Utah, in Harty, K.M., compiler, Technical reports for 1984 Site Investigation Section: Utah Geological and Mineral Survey Report of Investigation 198, p. 6-8. Gill, H.E., 1984, Santa Clara waterline improvements, Washington County, Utah, in Harty, K.M., compiler, Technical reports for 1984 Site Investigation Section: Utah Geological and Mineral Survey Report of Investigation 198, p. 12-14. Harty, K.M., 1989, Geologic hazards investigation for a proposed water tank site, New Harmony, Washington County, Utah, in Black, B.D., compiler, Technical reports for 1988-1989 Applied Geology Program: Utah Geological and Mineral Survey Report of Investigation 220, p. 20-24. Klauk, R.H., 1985, Virgin, Utah water purification project, Washington County, Utah, in Mulvey, W.E., compiler, Technical reports for 1985 Site Investigation Section: Utah Geological and Mineral Survey Report of Investigation 208, p. 56-67. Klauk, R.H., and Mulvey, W., 1986, Engineering geology for land-use planning for a parcel of state-owned land east of Washington County, Utah: Utah Geological and Mineral Survey Report of Investigation 212, 30 p.
Lund, W.R., 1983, Investigation of a proposed sanitary landfill site, Washington County, Utah, in Lund, W.R., compiler, Technical letters and memoranda for 1983 Site Investigation Section: Utah Geological and Mineral Survey Report of Investigation 190, p. 115-119. Lund, W.R., 1985, Evaluation of geologic conditions with regard to suitability for individual wastewater disposal systems at Winchester Hills Phase II Subdivision, Washington County, Utah, in Mulvey, W.E., compiler, Technical reports for 1985 Site Investigation Section: Utah Geological and Mineral Survey Report of Investigation 208, p. 159-172. Lund, W.R., 1997, Geologic-hazards investigation, three proposed school sites, Ivins, Washington County, Utah, in Mayes, B.H., compiler, Technical reports for 1997 Applied Geology Program: Utah Geological Survey Report of Investigation 236, p. 34-50. Lund, W.R., 1998, Evaluation of geologic conditions regarding suitability for individual wastewater-disposal systems at Winchester Hills Phase 8, Washington County, Utah, in McDonald, G.N., compiler, Technical reports for 1998 Applied Geology Program: Utah Geological Survey Report of Investigation 242, p. 3-17. Lund, W.R., and Case, W.R., 1986, Geologic evaluation of a proposed regional wastewater treatment plant site, Washington County, Utah: Utah Geological and Mineral Survey Report of Investigation 206, 22 p.
Lund, W., and Hecker, S., 1990, Inspection of new Quail Creek dike cutoff trench, Washington County, Utah, in Mayes, B.H., compiler, Technical reports for 1990-1991 Applied Geology Program: Utah Geological Survey Report of Investigation 222, p. 89-90. Lund, W., Olig, S., and Lowe, M., 1990, Second UGMS inspection of the new Quail Creek dike cutoff trench, Washington County, Utah, in Mayes, B.H., compiler, Technical reports for 1990-1991 Applied Geology Program: Utah Geological Survey Report of Investigation 222, p. 91-94. Black, B.D., Mulvey, W.E., Lowe, M., and Solomon, B.J., 1992, Investigation of geologic effects associated with the September 2, 1992, St. George earthquake, Washington County, Utah, in Mayes, B.H., and Wakefield, S.I., compilers, Technical reports for 1992-1993 Applied Geology Program: Utah Geological Survey Report of Investigation 224, p. 66-81. Lund, W.R., 1997, Reconnaissance of flood effects, January 3, 1997, storm, St. George, Washington County, Utah, in Mayes, B.H., compiler, Technical reports for 1997 Applied Geology Program: Utah Geological Survey Report of Investigation 236, p. 3-9. Christensen, G.E., 1986, Green Valley slope failure investigation, Washington County, Utah, in Mulvey, W.E., compiler, Technical reports for 1986 Site Investigation Section: Utah Geological and Mineral Survey Report of Investigation 215, p. 152-156. Harty, K.M., 1988, Geologic investigation of a landslide in Springdale, Washington County, Utah, in Black, B.D., compiler, Technical reports for 1988-1989 Applied Geology Program: Utah Geological and Mineral Survey Report of Investigation 220, p. 94-96. Lowe, M., 1992, Geologic reconnaissance of a landslide affecting Truman Drive, Santa Clara, Washington County, Utah, in Mayes, B.H., and Wakefield, S.I., compilers, Technical reports for 1992-1993 Applied Geology Program: Utah Geological Survey Report of Investigation 224, p. 50-55. Lund, W.R., and Vice, G., 2005, May 2005 landslide in Springdale, Washington County, Utah in Elliott, A.H., compiler, Technical reports for 2002-2009, Geologic Hazards Program: Utah Geological Survey Report of Investigation 269, p. 61-70. Solomon, B.J., 1995, Geologic reconnaissance of the Zion Canyon landslide of April 12, 1995, Zion National Park, Washington County, Utah, in Mayes, B.H., compiler, Technical reports for 1994-1995 Applied Geology Program: Utah Geological Survey Report of Investigation 228, p. 74-79. Lund, W.R., 2001, Possible collapsible-soil damage to a house at 55 South 3099 East, New Harmony, Washington County, Utah, in McDonald G.N., compiler, Technical reports for 2000-01 Geologic Hazards Program: Utah Geological Survey Report of Investigation 250, p. 11-16. Christenson, G.E., 1984, Rock-fall hazard, West Black Ridge, St. George, Washington County, Utah, in Harty, K.M., compiler, Technical reports for 1984 Site Investigation Section: Utah Geological and Mineral Survey Report of Investigation 198, p. 282-289. Knudsen, T.R., 2010, Investigation of the February 10, 2010, rock fall at 274 Main Street, Rockville, Utah: Utah Geological Survey Technical Report 10-1, 13 p.
Knudsen, T.R., 2011, Investigation of the February 10, 2010, Rock fall at 274 West Main Street, and preliminary assessment of rock-fall hazard, Rockville, Washington County, Utah: Utah Geological Survey Report of Investigation 270, 17 p.
Lund, W.R., Knudsen, T.R., Bowman, S.D., 2014, Investigation of the December 12, 2013, fatal rock fall at 368 West Main Street, Rockville, Utah: Utah Geological Survey Report of Investigation 273, 20 p.
Lund, W.R., 1996, LaVerkin Creek sinkhole geologic investigation, Washington County, Utah, in Mayes, B.H., compiler, Technical reports for 1996 Applied Geology Program: Utah Geological Survey Report of Investigation 231, p. 25-41. Gill, H.E., 1985, Teasdale water tank and spring evaluation, Wayne County, Utah, in Mulvey, W.E., compiler, Technical reports for 1985 Site Investigation Section: Utah Geological and Mineral Survey Report of Investigation 208, p. 96-105. Black, B.D., and Christenson, G.E., 1991, Geologic hazards investigation of three proposed water-tank sites, Weber and Davis Counties, Utah, in Mayes, B.H., compiler, Technical Reports for 1990 – 1991 Applied Geology Program: Utah Geological Survey Report of Investigation 222, p. 139-152. Case, W.F., 1984, Inspection of parking terrace excavation wall, 25th Street and Ogden Avenue, Ogden, Weber County, Utah, in Harty, K.M., compiler, Technical Reports for 1984 Site Investigation Section: Utah Geological and Mineral Survey Report of Investigation 198, p. 276-278. Christenson, G.E., 1984, Geologic hazards evaluation of a property in the northeast area of the Weber State College campus, Ogden, Weber County, Utah, in Harty, K.M., compiler, Technical Reports for 1984 Site Investigation Section: Utah Geological and Mineral Survey Report of Investigation 198, p. 249-254. Christenson, G.E., 1985, Investigation of 3 sites in Weber County for experimental individual wastewater disposal systems, Weber County, Utah, in Mulvey, W.E., compiler, Technical reports for 1985 Site Investigation Section: Utah Geological and Mineral Survey Report of Investigation 208, p. 175-182. Christenson, G.E., and McDonald, G.N., 2003, Review of “Geotechnical consultation, Radford Hills culinary water tank, Weber County, Utah” in Elliott, A.H., compiler, Technical reports for 2002-2009, Geologic Hazards Program: Utah Geological Survey Report of Investigation 269, p. 294-297. Harty, K.M., 1985, Geologic evaluation of a proposed landfill site in Weber County, Utah: Utah Geological and Mineral Survey Report of Investigation 203, 18 p.
Harty, K.M., 1989, Geologic hazards investigation of a proposed 2 million-gallon water tank site, city of Riverdale, Weber County, Utah, in Black, B.D., compiler, Technical Reports for 1988-1989 Applied Geology Program: Utah Geological and Mineral Survey Report of Investigation 220, p. 14-19. Klauk, R.H., 1986, Evaluation of Raintree No. 3 and Ted Holtry No. 1 Subdivisions for septic systems, Weber County, Utah, in Mulvey, W.E., compiler, Technical Reports for 1986 Site Investigation Section: Utah Geological and Mineral Survey Report of Investigation 215, p. 72-82. Lowe, M., 1987, Proposed water tank site, NE ¼, SE ¼, SW ¼ Sec. 22, T. 7 N., R. 1 E., just south of the Wolf Creek Development near Eden, Weber County, Utah, in Black, B.D., and Christenson, G. E., compilers, Technical Reports of the Wasatch Front County Geologists, June 1985 to June 1988: Utah Geological and Mineral Survey Report of Investigation 218, p. 91-97. Lowe, M, 1989, Geology, geologic hazards, and recommendations for land-use planning, Marriott-Slaterville Area Master Plan, Weber County, Utah, in Black, B.D., compiler, Technical Reports for 1988-1989 Applied Geology Program: Utah Geological and Mineral Survey Report of Investigation 220, p. 122-140. Lund, W.R., and Christenson, G.E., 1985, Geologic hazards investigation, Physical Education Building, Weber State College, Weber County, Utah, in Mulvey, W.E., compiler, Technical reports for 1985 Site Investigation Section: Utah Geological and Mineral Survey Report of Investigation 208, p. 8-13. McDonald, G.N., 2004, Review of “Engineering geology/geotechnical study, Quail Ridge Estates, Skyline Drive and Quail Ridge Drive, Ogden, Utah” inElliott, A.H., compiler, Technical reports for 2002-2009, Geologic Hazards Program: Utah Geological Survey Report of Investigation 269, p. 344-348. McDonald, G.N., 2005, Review of “Geotechnical study, Blue Spruce subdivision, Ogden, Utah” in Elliott, A.H., compiler, Technical reports for 2002-2009, Geologic Hazards Program: Utah Geological Survey Report of Investigation 269, p. 373-375. McDonald, G.N., 2006, Review of geologic hazard reports, proposed Shadow Mountain Phase II development, Ogden, Utah in Elliott, A.H., compiler, Technical reports for 2002-2009, Geologic Hazards Program: Utah Geological Survey Report of Investigation 269, p. 391-394. McDonald, G.N., 2006, Review of “Geotechnical study, Pineview at Radford Hills, Huntsville, Utah” in Elliott, A.H., compiler, Technical reports for 2002-2009, Geologic Hazards Program: Utah Geological Survey Report of Investigation 269, p. 401-404. McDonald, G.N., and Ashland, F.X., 2005, Review of “Geotechnical study, Riverdale housing development, 5633 South 1200 West, Riverdale, Utah” inElliott, A.H., compiler, Technical reports for 2002-2009, Geologic Hazards Program: Utah Geological Survey Report of Investigation 269, p. 364-367. McDonald, G.N., and Christenson, G.E., 2002, Review of two geologic reports for the Paramount subdivision, Ogden, Utah in Elliott, A.H., compiler, Technical reports for 2002-2009, Geologic Hazards Program: Utah Geological Survey Report of Investigation 269, p. 221-222. McDonald, G.N., and Christenson, G.E., 2003, Review of “Geotechnical/geological study, Kunzler subdivision, 6260 South 2125 East, Weber County, Utah” in Elliott, A.H., compiler, Technical reports for 2002-2009, Geologic Hazards Program: Utah Geological Survey Report of Investigation 269, p. 260-263. McDonald, G.N., and Lowe, M., 2004, Review of geotechnical reports, Basin View Estates, 5502 Snow Basin Road, Weber County, Utah in Elliott, A.H., compiler, Technical reports for 2002-2009, Geologic Hazards Program: Utah Geological Survey Report of Investigation 269, p. 317-320. Olig, S., 1991, Preliminary geologic-hazard evaluation of proposed Disaster Field Offices along the central Wasatch Front, Salt Lake, Utah, and Weber Counties, Utah, in Mayes, B.H., compiler, Technical Reports for 1990 – 1991 Applied Geology Program: Utah Geological Survey Report of Investigation 222, p. 25-31. Mulvey, W.E., and Lowe, M., 1991, Cameron Cove Subdivision debris flow, North Ogden, Weber County, Utah, in Mayes, B.H., compiler, Technical Reports for 1990 – 1991 Applied Geology Program: Utah Geological Survey Report of Investigation 222, p. 186-191. McDonald, G.N., 2006, Review of “Fault rupture investigation, 750 North Harrison Boulevard, Ogden, Utah” in Elliott, A.H., compiler, Technical reports for 2002-2009, Geologic Hazards Program: Utah Geological Survey Report of Investigation 269, p. 387-390. Olig, S., 1991, Probablilistic ground motions along the central Wasatch Front: Implications for a seismic zone change, Salt Lake, Box Elder, Weber, Morgan, Davis, Utah, and Juab Counties, in Mayes, B.H., compiler, Technical Reports for 1990 – 1991 Applied Geology Program: Utah Geological Survey Report of Investigation 222, p. 192-202. Black, B.D., Christenson, G.E., McDonald, G.N., 1999, Reconnaissance of flooding and sediment deposition from a breach of the Davis-Weber Canal near 1345 West 5300 South, Riverdale, Weber County, Utah, in McDonald, G.N., compiler, Technical Reports for 1999 Applied Geology Program: Utah Geological Survey Report of Investigation 244, p. 3-10. Ashland, F.X., 1998, Preliminary geotechnical-engineering slope-stability assessment of a bluff and cut slopes at Hidden Oak subdivision, South Weber, Weber County, Utah, in McDonald, G.N., compiler, Technical reports for 1998 Applied Geology Program: Utah Geological Survey Report of Investigation 242, p. 21-27. Ashland, F. X., Giraud, R. E., McDonald, G. N., and Elliott, A. H., 2008, Ground-water conditions in the Green Pond landslide, Weber County, Utah: Utah Geological Survey Open-File Report 528, 8 p.
Black, B.D., 1998, Investigation of a recent cut-slope failure and implications for geotechnical slope-stability recommendations at Green Hill Country Estates Phase VI, Ogden Valley, Weber County, Utah, in McDonald, G.N., compiler, Technical reports for 1998 Applied Geology Program: Utah Geological Survey Report of Investigation 242, p. 50-51. Black, B.D., and Lowe, M., 1991, Investigation of seeps and landslide potential in South Weber near 5939 S. Weber Dr., Weber and Davis Counties, Utah, in Mayes, B.H., compiler, Technical Reports for 1990 – 1991 Applied Geology Program: Utah Geological Survey Report of Investigation 222, p. 181-185. Harty, K.M., and Lowe, M., 1991, Preliminary geologic evaluation of an earth slump in the Green Hill Country Estates Subdivision in Ogden Valley, Weber County, Utah, in Mayes, B.H., compiler, Technical Reports for 1990 – 1991 Applied Geology Program: Utah Geological Survey Report of Investigation 222, p. 119-125. Lowe, M., 1985, Investigation of landslide at approximately 5931 South Weber Drive, Riverdale, Weber County, Utah, in Black, B.D., and Christenson, G. E., compilers, Technical Reports of the Wasatch Front County Geologists, June 1985 to June 1988: Utah Geological and Mineral Survey Report of Investigation 218, p. 80-82. Lowe, M., 1985, Report of geologic reconnaissance: Landslide southwest of Gibbons and Reed Co. north pond, west of Uintah, Weber County, Utah, in Black, B.D., and Christenson, G. E., compilers, Technical Reports of the Wasatch Front County Geologists, June 1985 to June 1988: Utah Geological and Mineral Survey Report of Investigation 218, p. 76-79. Lowe, M., 1988, Causey Estates Landslide, Weber County, Utah, in Black, B.D., and Christenson, G. E., compilers, Technical Reports of the Wasatch Front County Geologists, June 1985 to June 1988: Utah Geological and Mineral Survey Report of Investigation 218, p. 86-90. Lowe, M., 1988, Combe Road landslide, Weber County, Utah, in Black, B.D., and Christenson, G. E., compilers, Technical Reports of the Wasatch Front County Geologists, June 1985 to June 1988: Utah Geological and Mineral Survey Report of Investigation 218, p. 83-85. McDonald, G.N., and DuRoss, C., 2005, Investigation of a landslide north of the mouth of Ogden Canyon, Weber County, Utah in Elliott, A.H., compiler, Technical reports for 2002-2009, Geologic Hazards Program: Utah Geological Survey Report of Investigation 269, p. 53-60. Solomon, B.J., 1998, Reconnaissance of a landslide near the Cedar Bench subdivision, South Weber, Weber County, Utah, in McDonald, G.N., compiler, Technical reports for 1998 Applied Geology Program: Utah Geological Survey Report of Investigation 242, p. 42-49. Olig, S., 1991, Preliminary assessment of geologic hazards at tele-communication facilities and microwave towers throughout Utah, in Mayes, B.H., compiler, Technical reports for 1990-1991 Applied Geology Program: Utah Geological Survey Report of Investigation 222, p. 153-161.